Today we wait for someone to drag our corpse home, ponder Kirby’s feet, watch rich white dudes “dance” and discuss who saw a fleshlight last weekend. It’s Morning Checkpoint! Sometimes it is best to let our memories live on in our head and not dig too deep. But, I’m happy Mike did because this story is a wonderful return to something so many folks loved. I assume most folks reading this have already read this amazing piece by Jason, but if you haven’t you should. Even if love Anthem, this is a great story that really sheds some light on the problems facing developers. What are you hiding Nintendo? Let Kirby be himself. Let him take his shoes off. Let him live a little. Please. I can’t wait for other politicians, desperate to catch up with AOC, to start streaming themselves as they build some shelf they got from Target while drunk on whiskey. I love that Ubisoft cares so little about their popular Rabbids that they just let them get their asses chopped up for a joke. Dance like no one is watching, you nerds. Did You See A Fleshlight? 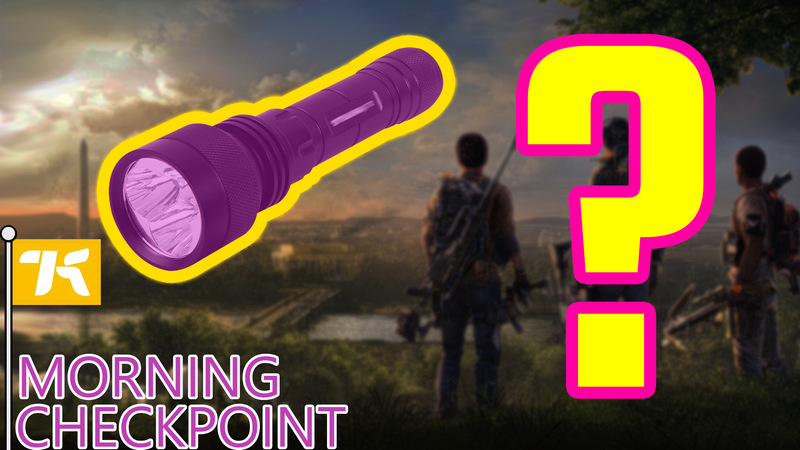 Last weekend I posted a simple story about players wanting flashlights in The Division 2. I remember writing it up, creating a quick image for the story and then posting it. I didn’t think much of it until folks starting commenting, on Facebook, Twitter and on Kinja, that they had seen something else in my image. So I ask now, did you see a fleshlight? I honestly, no joking here, had no intention to trick or mess with folks. I picked those colors based on the bright shades of yellow, orange, pink and purple that Kotaku often uses for logos or other stuff. But apparently, I created something I didn’t intend to and some folks immediately saw a fleshlight. The headline didn’t help, as fleshlight and flashlight are very similar looking words. Especially when scrolling quickly through Twitter. Personally, I didn’t see a fleshlight in the image and I still don’t see it. Googling for fleshlights it appears the main reason folks got mixed up is the slightly pinkish hue at the front of the light. Though I think some of you just wanted to see a fleshlight. No shame in that either. This looks good, but I wish we got a chance to play the adventure game based on the show that Telltale was working on. Here are the free retro games Nintendo is giving you this month if you have a Nintendo Switch Online membership. I want to be a monkey and I want to do monkey things. I like to think after creating his model, Naughty Dog developers looked at it for a bit then at each other then back at it. This went for some time. They all knew what had to be done. They needed to kill it. But then someone else interfered and the world was gifted Crash. Kirby is a wholesome and loveable character. I will not even humor the idea of him running around on folded knees like something that fell out of a Dark Souls game. I would never have enjoyed playing Everquest, but I LOVE hearing all these stories of the strange things it included. They don’t make games like EQ1 anymore, which is probably a good thing. But we’ve lost stories like this.